"I just wanted a really good chocolate pie, but I also love chocolate mousse. Who doesn't? So, I started with a base recipe, but ended up adding my own ingredients and amounts to get the perfect chocolate mousse pie with chocolate whipped cream topping. Garnish with some finely chopped chocolate and fresh raspberries." Chill a large bowl for about 1 hour. Melt chocolate and butter in the top of a double boiler over simmering water until smooth, about 5 minutes; remove from heat and allow to cool slightly. Whisk egg yolks into chocolate one at a time, allowing each yolk to blend completely before adding the next. Beat egg whites in another bowl until foamy. Beat in cream of tartar. Gradually beat in 1/4 cup white sugar until soft peaks form. Lift your beater or whisk straight up: the tip of the peak formed by the egg whites should curl over slightly. Beat 1/2 cup heavy cream in chilled bowl until thickened. Add 2 tablespoons white sugar and 1/2 teaspoon vanilla extract; continue to beat until soft peaks form. Gently fold egg whites into chocolate mixture. Fold whipped cream into chocolate mixture until mousse is just blended. 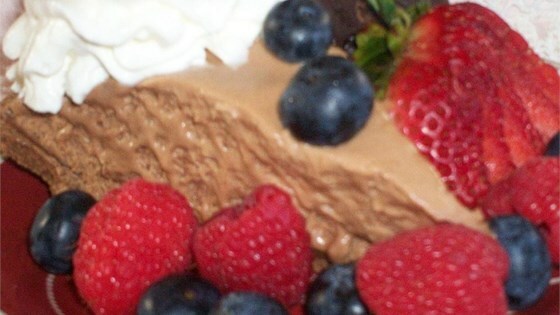 Spoon chocolate mousse into pie crust. Refrigerate until ready to serve. Beat 1 cup heavy cream, 1/3 cup white sugar, 2 tablespoons confectioners' sugar, cocoa powder, 1/4 teaspoon vanilla extract, and salt in bowl until soft peaks form. Spoon over chocolate mousse before serving. You do not have to garnish it with the raspberries and chocolate, it just makes it look a little nice, and the raspberries add a little something nice to the flavor.